Save the Date! 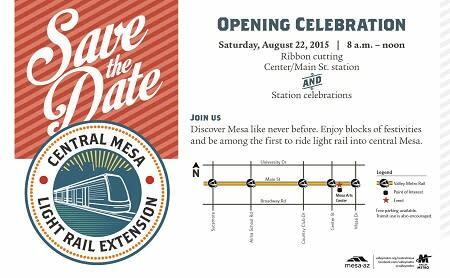 With four more stations and three more miles of light rail coming to Mesa, you won’t want to miss Valley Metro’s Grand Opening Celebration August 22! The celebration will go from 8 a.m. to noon on Center and Main St. and will include the ribbon cutting and an opportunity to ride the new light rail. Valley Metro will be giving away free transit passes to those that come out to celebrate with us that morning. You won’t want to miss this celebration! Don’t fret about the heat—Valley Metro has that handled with cooling and hydration stations at each station, plus each station will host activities for the whole family! There will be live music, children’s activities and more through the 3.1 miles of new rail. Make a family outing to the event with free admission to the Natural History Museum and the i.d.e.a. Museum from 9 a.m. to noon during the festivities as well! In anticipation of the event, Valley Metro is hosting a staycation prize package raffle to help get the community involved in meeting the local businesses along Main Street. Want more details on how to enter? Visit Valley Metro’s website. Make sure to pencil August 22 into your calendar. We’ll see you there!